Plumbers of Suojanen Enterprises is your innovative leader in the Tampa Bay area, supplying a complete foundation of support for virtually any type of new construction project large and small. While completing over 2,000 of your new homes each year, we’re proud to have achieved distinction as an innovative leader in business and in our local industry. Effectively handling your needs smoothly and efficiently is what sets us apart. Our state-of-the-art management controls are extraordinary, with the capability to report on virtually everything related to your job. We know exactly how many hours of work are on backlog at any moment. A constant ambition to adapt new technology and update systems is what truly separates Plumbers of Suojanen Enterprises from our competition and eliminates overscheduling issues from the equation. We track profitability to an amazing degree and from our command center are able to oversee an incredible amount of issues—from managing staff location at any given time to even the slightest details like warrantee statistics. This tells us where any potential problems lie and enable us to address these issues before they arise. We always know where we stand in In relation to your job budget every time at any time. We have consistantly been awarded the prestigious Angie’s List Super Service Award! This award reflects our company’s remarkable plumber reviews in Tampa and our consistent record of customer satisfaction in the Trinity, FL and the Tampa Bay area. 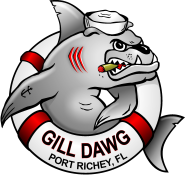 Gill Dawg is a dining, recreation and entertainment hub located on the Cotee River in Port Richey. We strive for excellence in everything that we do. Our restaurant is climbing its way to the Top 10 Restaurants List in Port Richey on Trip Advisor and is listed as one of the top attractions on trip Advisor as well. Gill Dawg we focus on eco-friendly, healthy activities and entertainment with a strong emphasis on paddling and water sports. You can relax in our serene waterfront atmosphere while you enjoy an artisan sandwich with a glass of your favorite beverage. Guided eco-tours, paddlesports equipment, pontoon and jon boat rentals, jet skis, fishing charters, sunset cruises, music, good food, family friendly – you’ll find it ALL at Gill Dawg!